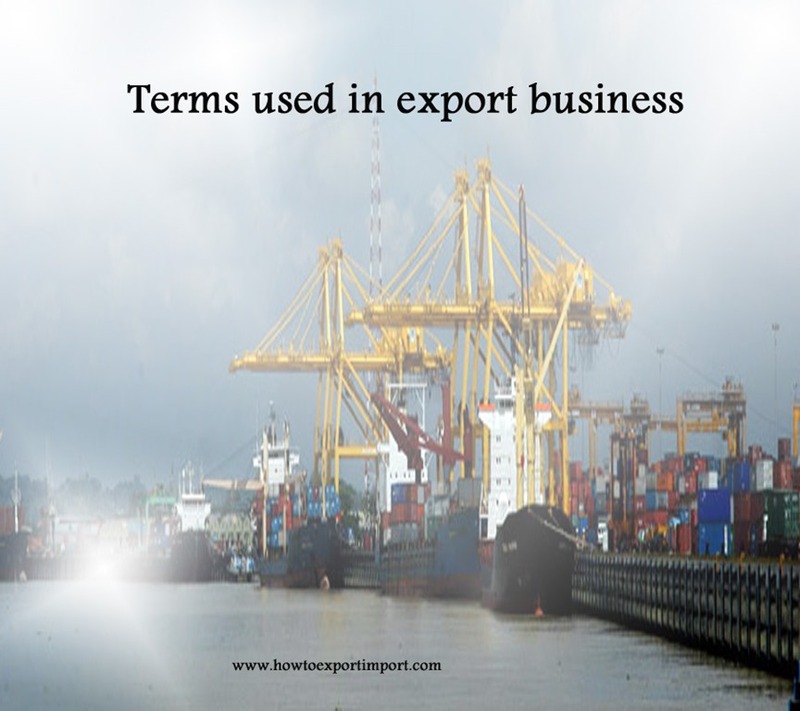 Terms used in export business such as Foreign Nationa,Foreign Person,Free Carrier,Free circulation etc. This post explains about terms used in export business such Foreign exchange,Foreign Nationa,Foreign Person,Free Carrier,Free circulation,Free on board,Free trade,Free zone etc.. These terms used in international business are arranged in alphabetical order and you may add more information about terms used in export business at the end of this article, if you wish. Foreign exchange - A term in which money from one country is exchanged for that of another. Foreign exchange risk :You're particularly at risk if you hold or receive a foreign currency which is volatile or very weak. Some currencies present extra difficulties -for example, there may be exchange controls requiring government approval before you can exchange a particular currency. Foreign freight forwarder - See Freight forwarder. Foreign Person - Both the EAR and ITAR define "foreign person" as any foreign corporation, business association, partnership, trust, society, or any other entity or group that is not incorporated or organized to do business in the United States as well as international organizations, foreign governments and any agency or subdivision of foreign governments (e.g. diplomatic missions), and anyone who is not a U.S. citizen, a lawful permanent resident of the United States (i.e., a "green card" holder) or who does not have refugee or asylum status in the United States. 'Foreign national' is not an ITAR term per se, but the ITAR does define the term "foreign person" as any natural person who is not a lawful permanent resident or who is not a "protected individual". This also includes any governmental entity. Foreign sales agent - An individual or firm that serves as the foreign representative of a domestic supplier and seeks sales abroad for the supplier. Foreign Sales Representative:A representative or agent residing in a foreign country who acts as a salesman for a U.S. manufacturer, usually for a commission. Sometimes referred to as a "sales agent" or "commission agent." See "Representative." Foreign Trade Zone:An area where goods of foreign origin may be brought in for re-export or transhipment without the payment of customs duty. Foreign-currency accounts: it may be more convenient for you to set up foreign-currency bank accounts if you frequently issue foreign-currency invoices. In particular, a euro bank account gives you flexibility in trading with businesses in eurozone countries. Foreign-exchange risk: you're particularly at risk if you hold or receive a foreign currency which is volatile or very weak. Some currencies present extra difficulties - for example, there may be exchange controls requiring government approval before you can exchange a particular currency. Forward foreign exchange contract: exporters can hedge against the risk of adverse exchange rate movements by using a forward foreign exchange contract. You agree to sell the bank a particular foreign currency at a fixed future date for a price that is set now. Forwarding agent - This is the person in the country of origin who is authorized by a principle party in interest to perform the services required to facilitate the export of the items from the country of origin. This may include air couriers or carriers. In routed export transactions, the forwarding agent and the exporter may be the same for compliance purposes under the EAR. Free alongside ship (FAS) :An Incoterm, where the seller clears the goods for export. Delivery takes place when the goods are placed alongside the relevant ship at a named port. From this point the buyer bears all costs and risks. Free Carrier (...named place):The seller must clear the goods for export, and deliver them to a carrier at a specific point determined by the buyer. The buyer then bears all costs and risks of transporting the goods to the desired destination. Also see "Named Point and "Specific Delivery Point." Free carrier (FCA) :An Incoterm, where the seller is responsible for clearing the goods for export and delivering them to a specified place. This could be the seller's premises or those of a carrier or freight forwarder. The place of delivery determines who is responsible for loading or unloading the goods. Once the goods are delivered the buyer bears all costs and risks. Free circulation :Goods of wholly Customs Union origin (including component parts), or goods imported into the Union on which all the import formalities have been completed, and all the duty due has been paid and not repaid in whole or part. Free circulation: goods are in free circulation in the EU if they originate from an EU country or have already been imported, all customs charges paid, into an EU country. Free in and out (FIO) :The freight rate covers the sea freight only. The costs of loading and discharging the cargo are not included. Free on board (FOB) :An Incoterm, where the seller clears the goods for export and delivers when the goods are passed over the ship's rail at the specified port. From this point on the buyer bears all costs and risks. Free Port:An area generally encompassing a port and its surrounding locality into which goods may enter duty-free or subject only to minimal revenue tariffs. Free SaleL:See "Certificate of Free Sale." Free trade - The theory of free trade contends that everyone in the world will be better off if each nation eliminates tariffs and other barriers to the flow of products across borders. Free Trade Zone: A port designated by the government of a country for entry of any non-prohibited goods. Merchandise may be stored, displayed used for manufacturing, etc., within the zone and re-exported without duties being paid. Duties are imposed on the merchandise (or items manufactured from the merchandise) only when the goods pass from the zone into an area of the country subject to Customs. Free Trade:A theoretical concept that assumes international trade unhampered by government measures such as tariffs or nontariff barriers. The objective of trade liberalization is to achieve “freer trade” rather than “free trade,” it being generally recognized among trade policy officials that some restrictions on trade are likely to remain in effect for the foreseeable future. Free zone :A designated and approved area where imported goods may be stored without payment of VAT or import duty. Free zone goods :Goods within the designated free zone area which have met the necessary requirements to gain free zone status. Free zone manager :The company authorised in the designation order as the responsible authority for controlling the free zone. Freedom of association - The right of all workers to join or form a trade union of their own choosing and carry out trade union activities without interference from their employer or from public authorities. Free-trade zone - A port designated by the government of a country for duty-free entry of any non-prohibited goods. Merchandise may be stored, displayed, used for manufacturing, etc., within the zone and reexported without duties being paid. Duties are imposed on the merchandise (or items manufactured from the merchandise) only when the goods pass from the zone into an area of the country subject to the customs authority. Freight Carriage (and insurance paid to):Like "Freight or Carriage paid to..." but with the addition that the seller has to procure transport insurance against the risk of loss of or damage to the goods during the carriage. The seller contracts with the insurer and pays the insurance premium. Can export benefits be claimed with payment through insurance companies? Nageswar Reddy : On 17 August 2016 Actually we are planning to open a import export company in Mumbai with one of my foreign national and i would like to make him as a partner in that company. What is the necessary steps should i follow please give me your valuable? suggestions or else if there any agency to take care of all those works. please forward me those details.